The company reaches a major milestone with its 25th Anniversary, via an ongoing commitment to software engineering excellence, a dedicated team of 800+ professionals, a growing customer base, broad industry recognition and a continuous passion for technology innovation and R&D. 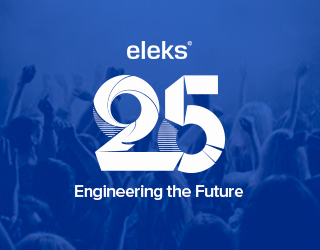 ELEKS, a global organization that provides end-to-end, software product engineering services, is proud to announce 25 years operating in the IT market, designing, developing and enhancing software products for international market leaders, including Fortune 500® companies. Established in 1991, ELEKS was one of the first software development businesses in independent Ukraine. Since 2014, the company has been listed by IAOP as one of the world’s 100 best outsourcing providers, and focuses on enabling business innovation through software product engineering services. The company keeps expanding its presence in the U.S. and UK markets, as well as in Europe, with plans to strengthen its offices in Kyiv, Rzeszów and Kraków. The customer conference featured technology demonstrations, a roundtable discussion and feedback session on the day prior to the company-wide celebration. Guests had an opportunity to learn about ELEKS’ latest service offerings and strategies, covering Software Product Engineering services, Data Science, as well as the internal R&D Platform and ELEKS’ creative engineering approach.